Such a delight today to talk to the extraordinary Lea Wait. 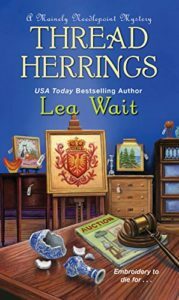 Life-long advocate for single-parent adoption and the adoption of older children, writer of historical books for young people and cozy mysteries for adults, Lea is as fascinating as her novels. Start by checking out her website, which includes discussion guides for her Antique Print Mystery Series and teacher guides for her books for children. Like Maggie Summer, the heroine of her first series, Lea has worked as an antique dealer. She credits her grandmother — also a dealer, in dolls and toys — with sparking her love for antiques and auctions. The warmth in her novels is clearly echoed in our conversation when she talks about her family and the community of antique dealers — which didn’t stop her from plotting to kill some of them off! On the page only, of course. Lea has so many books, I’m going to fail in any attempt at getting them all in order. However, her own website does a terrific job of parsing them so I’ll link you back to that, and of course to her author page on Amazon. Although they’re not mysteries, if you have children in your life, do check out her historical novels. As you’ll see from our conversation, they give a very nuanced look at life in the 1800s. In addition to her website, you can keep up with Lea on Facebook and Goodreads. Laura Brennan: Author Lea Wait has written historicals, children’s books, nonfiction, and not one, not two, but three cozy series set in her home state of Maine. Lea, thank you for joining me. Lea Wait: It’s wonderful to be here. Thank you for inviting me. LB: You are so interesting and accomplished that I almost don’t know where to start. But since I’m a theater person, let us start with college because you majored in drama and English. LW: I did indeed. It’s been actually an immense help. I’m not sure my family was enthused at the moment, but I always wanted to be a writer and by working the theater, I learned a lot about dialogue. LB: Well, you are writing professionally pretty much from the get-go. You are writing speeches and films. How did you get started? LW: Well, actually, I did think I was probably just going to go on to graduate school — writers, they teach, so — but I ended up with a job interview and I ended up talking to someone who had graduated from the Yale School of Drama, and he said, “You write plays.” And I said, yes. He said, “Have you got any with you?” Of course I was young, I graduated from college early, so I was 20, long blonde hair, protest marches on weekends — dates me a little bit. The first executive speech I wrote was for the president of what was then part of AT&T, the Western Electric Company. I became fascinated. I was the only woman they had hired at a management position in public relations at that time nationally, and they gave me assignments to do things like films. For two years I did a television program for AT&T. So I did a lot of things, I worked with men, which was a whole new thing for me because I’d gone to a woman’s college. And I was learning a lot about writing to different audiences on all different topics. LB: And then as if things weren’t busy enough, you decided to adopt. LW: That’s true. One of the things that I had wanted in life, I wanted to be a writer, I wanted to live in Maine, and I did want to be a mother. And it wasn’t working out with men in my life, that I ended up adopting four older girls, they were ages 8 to 10, and they came from Thailand, Korea, Hong Kong and India. So all different kinds of backgrounds. And I got very involved in advocacy for single parents, adoptive single parents, and for people adopting older children. At that time that I did that, I was one of the first people to do that legally because there were some immigration laws that required signatures of both parents, and President Ford was the one who changed that. So I was one of the first people to do that, and I was relatively young for a single adoptive parent. My first daughter came home when I was 30. I did a lot of writing about adoption and adopting older children and I did that basically until my girls were teenagers. So when I was about in my mid-40s, I switched from writing nonfiction to writing fiction. And I’ve used my experiences as an adoptive parent certainly and a lot of my books, but instead of being just an advocate for adoption and adopting my children, now I write mysteries and I read historical novels about people searching for love, acceptance, a place to call home. So the adoption is still deep down inside of me as an issue. LB: I love, too, that you’ve mentioned Louisa May Alcott and her influence. You were rather like Jo in Little Men, but you were also Marmee. You have four daughters! LW: That’s right. Just yesterday I was speaking at a school here in Maine and I told the kids there to be careful what you really read a lot of really love, because it may change your whole life. I hadn’t really thought about the fact that Little Women was my favorite book and I read the whole Orchard House series over and over again, memorizing parts of it. And I was interviewed by the New York Times when I was about 32 and they asked me what my favorite book had been, and she looked at me and she said, “And now you have four daughters. And you’ve adopted kids the way that Jo did in Little Men.” And I honestly had not thought about it until that point, but it made perfect sense. I basically grew up to be the character I loved most in my books. LB: I always feel that as writers, we write the things that work on us, we write the themes that matter to us whether we necessarily notice them or not. But I think it’s true of living as well. We live those themes. LW: I think we do. And sometimes we do it much more consciously than other times certainly. Now, I am very conscious of it and even conscious of it in my books, because when I first started thinking about the books that I had written, my books for young people are basically, the main characters are ages 11 to 15 and most of them are set in the 19th century. And so that also goes back to that whole period of time. Those were the books that I loved. I lived in a house that was built in 1774, I was a fourth-generation antique dealer at one point my life, so I grew up going to auctions and antique shows. They were just a part of my life. I made my first auction purchase when I was about 10 years old and I bought a copy of the first edition of the Encyclopedia Americana. And my grandmother, who is sitting next to me, and who was a doll and toy dealer I might add, just looked and said, “What are you going to do with all those old books?” And I said, “Well, someday, I’m going to write historical novels.” And she said, “Oh. All right.” I do have that set of encyclopedias in my study today. I don’t use them very much I will admit, but I do look at them and remember that period of time and saying that I predicted totally out of the blue that that was the one thing I was going to do when I grew up. LB: I want to come back to your children’s books, but this is such a good segue I can’t miss it. It leads so nicely into your Antique Print Mysteries. LB: You do credit your family and your grandmother particular with getting you interested in antiques. LW: Yes. As I said, she was a dealer, she was a doll and toy dealer, which of course as a child, I particularly liked. The child I went with her to auctions, I remember going with her to visit her antique dealer friends when she was making purchases when I was five, six years old. We went to auctions, and then when I was a little older, my very first money that I earned from someone outside the family was fifty cents that I was paid to booth-sit at an antique show so that someone could go have lunch. But I was very familiar with antique shows and with antiques and so forth. It was just a part of my life. And then when I was older, when I was in my 20s, about the time, actually, that I started adopting children, my mother said maybe she should start an antique business. She was an artist and had retired recently. I said, well, I was going to do that. And she said, “Well, we could work together because you’re working full-time and I could do a lot of the legwork.” So I opened the business and she kind of worked for me for years and because she’d been an artist, she was interested in antique prints and that’s what we got involved with doing and specializing in. It was a lot of fun. I felt very at home in the whole antiques community. The first series that I wrote of mysteries was about an antique print dealer — now, she also works of the college professor because you do need a day job if you’re going to be an antique dealer. It’s not an easy way to make a living. But my character, Maggie Summer, is an antique dealer. She’s also interested in maybe adopting older children, so it was my first mystery series and it took more from my own life really than any of my other series. That series now has eight books in it and was an Agatha nominee, so that was kind of an exciting way to start. And actually, the second series that I’ve written, which is the Mainely Needlepoint series, there is of course an antique dealer in it. The most recent book, which is one that is going to debut today, October 30, is called Thread Herrings. It includes information about adoptions, antiques, antique prints, and in this case antique needlepoint because that’s what that series is about. LB: How did you make that leap? Why mysteries? LW: It was a leap. When I first decided I was going to really start writing fiction — which I had always wanted to get to but somehow never felt it was the right time I didn’t have enough to say somehow — I started to write literary fiction, which I always think is a very funny term because all fiction to me is literary in some way or another. But in any case, I was writing literary fiction and I had some short stories published in little magazines and so forth, so all very literary. But I never could, somehow, get a whole book together. I’d write 100 pages for something and I’d always think it would be brilliantly written of course, but it didn’t seem to go anyplace. It was very frustrating. And actually I had a good friend, also a single adoptive parent, and she read mysteries all the time. I hadn’t read mysteries since high school. We go out to dinner, get away from the kids for an evening, and I’d be sitting there worrying about the plots that I couldn’t get to come together and she’d say, “Oh, well, you just need to kill somebody off. I have this great idea, you could do this, you could do that and she would tell about her mysteries and I just sort of listened and listened and I really didn’t pay that much attention. Then one day, in my van, and I was driving to a large antique show in Rhinebeck, New York, which I ended up doing for about 32 years. A big show, 200 dealers, everybody had room settings or tables that would take up a whole room. And every year, you were next to the same people you were the year before. So you got to know them, and it was sort of like a homecoming. I was driving up there and all of a sudden I thought about the books that my friend had been talking about, you know, the classic Agatha Christie ‘house party in the country.’ You have tons of people who are coming for the weekend, you of course get all snowed in, and of course somebody is killed. And you have to solve the crime before everyone goes home. And I thought, you know, that’s kind of like an antique show. I’m going to go, I’m going to see the same people that I see every six months at this particular show, and we’ll all set up our own little world, and will deal with each other and with customers all weekend. Wouldn’t it be cool if somebody died the first night? And I said, “Well, tell me who I should read because I haven’t read mysteries.” And I literally sat, and I read about 200 mysteries in about six months. I had no clue that there were so many genres of mysteries, sub genres… I mean, cats solving crimes, burglars solving crimes, it totally blew my mind. But I realize the idea I had, to have an antique dealer solving crime, that obviously fit into the large category of cozies. And it didn’t work. Although my books are not ultra cozy — edgy cozy, some people have called them. Because I do deal with political issues and with other kinds of issues. I wrote that book, I drank an entire bottle of champagne to say, look, I wrote 300 pages all in order and they all make sense, and then I was rejected by about 40 agents. I actually wasn’t discouraged. I put the book in the bottom drawer and said, well, in all the books on writing, it says you have to have an unpublished manuscript in your bottom drawer, now I have mine. I just sort of said, nine months? I hadn’t even thought about a second one in the series. And she said, “That’s great! The only thing we have to change is that awful title.” My brilliant title, Kill Me Quick Before I Die, turned into Shadows at the Fair and was an Agatha finalist the next year for best first mystery. LB: Tell me about the Needlepoint series. This is a second series, this is the one, Thread Herrings comes out today. Tell me a little bit about how you developed that second series. LW: My agent called me and asked me if I would write a series around needlepoint. And I said, I don’t know anything about needlepoint. Which wasn’t totally true, but I’d never done needlepoint. The only needlepoint I knew about, I’d learned at antique shows of course. But finally I thought about it, and I decided, okay, if I can make my series different than other people’s. And I came up with a marketing plan. My series is one of the very few and may be the only craft cozy series that does not revolve around a shop. My major character is young, she’s in her 20s, she does not do needlepoint. She’s learning a little bit, I think she’s learned more than I have so far, but she is taking over a business that her grandmother started and they — a group of people in town who are very diverse people — they do custom needlepoint for high-end specialty stores or interior designers and so forth. One of people in the group, the Mainely Needlepoint group, one is an antique dealer of course, one is an elderly woman who has supported her family for years anonymously writing erotica. One of them is a man who retired from the Navy with a disability and he now teaches high school biology, and he has a poison garden. So these are all very practical kind of skills that one can move into in a mystery. And I’ve had really a lot of fun writing about a small harbor town in Maine with an active waterfront and people who are diverse within themselves and all have back stories, too, that do come out in varying ways in the series. Thread Herrings, which is the one that comes out today, is the seventh in the series and the next one will be out next May. So it continues on. LB: One of the things I really like about cozies in general is a community aspect. Cozies are very much about having loved ones, family and friends who rally around you and you are accused of murder, which inevitably happens. LB: Of course. As one does. And then you rally around them when they’re accused of murder. More so than the Antique Print series, the Needlepoint series is much more community oriented. You are in just one place instead of moving around. You really embrace it. You create this community of people who are all very different from each other and all have something to offer. LW: Yes. That’s the intent. The first series, I intentionally was avoiding Cabot Cove syndrome and it was relatively simple with an antique dealer because an antique dealer does move around. He or she does shows in different areas, they go to auctions in different areas. My character teaches at a college in New Jersey, at least at the beginning of the series. But her best friend, for example, who has post polio syndrome, lives on Cape Cod and so she visits the Cape and she sees her friend at different shows. Then she gets involved with a man from Maine and of course that ties the series together with the Maine tie. Of the eight books that are in the Shadows series, only four of them are actually set in Maine because that first one was set in New York and there are two set in New Jersey and one set on Cape Cod. Some people like that. Other people really want the coziness of the same settings, the same people. And so by doing two different series, I was able to incorporate those two things. And it makes it much more interesting as an author, too. Setting is very important to me, and Maine particularly because I love Maine so much. But there are all different places in Maine and different types of places, so that the Shadows series, the parts of it that are set in Maine are set about 12 miles inland on a deep river. So there is a waterfront there, but it isn’t ultra-involved with the people who work on the waterfront. It’s really involved more with the town with antique dealers, and as I said, adoption is a theme in that book also. Where in the Needlepoint series, we are in an active, small waterfront community that is active so that there are people who are fishermen and lobstermen, and there are people who boil lobsters for the tourists in the summertime. It’s a whole different environment even though it’s also set in Maine. LB: So what can you tease me about the new book, Thread Herrings? LW: In the new book, my major character, Angie Curtis, goes with her friend Sarah Byrne, who is an antique dealer, to her very first auction. She decides she’s really intrigued by an old piece of needlepoint that looks sort of like a coat of arms, but she can’t quite figure it out. Sarah think she’s totally crazy, but Angie buys it, takes it home, and when she takes it out of the frame, she finds a document from 1757 that’s a claim for a child from a foundling hospital. She decides she has to do research about this and find out who this child was and what the connection to Maine was, but when she does that she starts getting death threats. One of the fun things about Thread Herrings is that in some mysteries there’s a locked room murder where whoever is killed is killed in a locked room and how could anyone get to them? Well, in Thread Herrings, we have a locked detective because the police put her in protective custody and she has to solve the murder while staying in one place. That was fun to write. LB: So why Cornelia Kidd? How did that come about? Why that book? LW: That was another one were actually the publisher went to my agent and asked if I had anything on the shelf. They liked my writing and they’d like me to write a series for them. And I thought, oh, this is great! A lot of ideas, historical mysteries, some that were a lot edgier than I’d been working on. Not quite thrillers but some interesting ideas that I’d had. So I sent my agent six different proposals for him to share with this publisher and the answer that I got back was, well, those are all really nice but we really want something about a woman who lives on the coast of Maine. And I went, argh! I’ve done that. I’ve done that twice. But then I started thinking about it and I said, okay, one can do anything else. One can do something else. So that series is actually set on an island and it has a whole different kind of environment, and that one is more of a foodie mystery. But Cornelia Kidd, publisher also thought that although I could tell everybody that it was really me, they wanted to start out with a new name because they were new publisher. And Cornelia Kidd is a real person. Cornelia Kidd was my father’s mother. I never met her. She died in 1911 when the car that she was in was hit by a train on a railroad crossing in New York state. I’d always loved her name and I thought, this is sort of a way to connect with the past and also to tell a different story. So Cornelia Kidd may have died over 100 years ago, but I re-created her in a sense by using her name in that book and that series. And that’s been special to me to be able to do that. My father is long since gone, no one other than my immediate family understands that, but it’s another, I guess, tied to the past. I’m still living in this late 19th century, early 20th century world. LB: Well, that does give me a chance to ask you again about your children’s books, which I did not want to miss. You do such a number of interesting things with them. For one thing is, you have major characters who are not often represented in books. And I’m thinking particular of Will who is an amputee. You don’t generally see children amputees as major characters. LW: No. I said place is very important to me, so what I wanted to do was set — and most of my books for young people are set at least partially in one town in Maine, but for different years. Many of the characters my books are real people who lived in that town during that period of time and I’m really telling their stories. But I also really wanted to not write the kind of historical novels that has George Washington riding his horse through town and sleeping in the house next door and all that. I really wanted to write about real people — women, children, those who were not totally accepted, perhaps, by the community in some way or another. A disability would certainly qualify as one of those things. And I wanted to show how communities worked together. Again, searching for love, acceptance, and a place to call home. The book that you referred to is Wintering Well and it’s actually been one of my most popular books for young people. It is about a boy who wants to be a farmer, all his life he’s wanted to be a farmer. That’s his whole goal in life. And in the very first chapter, he drops an axe when he is chopping wood because his sister screams about something as sisters tend to do occasionally. And he ends up having his leg amputated. In that book, which is set in 1819, 1820 — so it has a background of Maine statehood — each chapter starts with a journal entry from his sister Cassie who is a year younger than he is and who decides of course that she’s responsible because this awful thing has happened. So she is going to take care of her brother. Well, obviously, that doesn’t work out too well. But brothers and sisters don’t see life the same way. So we travel with Will and Cassie through a year in which he decides he is going to somehow become self-supporting even though his family says, you’re disabled, you can never be a farmer. No, but maybe he could be something else. And Cassie also has some ideas in that direction, although she’s a girl. So she, a lot of options so we would normally think would be open to her were not at that time. And I make sure that they are not. One of the things that drives me crazy in historical novels is when they give someone in the past the sensibility of someone today. That bothers me a lot. But I have written about, in that case, someone who has a disability, a physical disability. The school that I was speaking to yesterday, they had read my book Finest Kind in which there are several characters who have intellectual disabilities to different degrees. And there’s an old woman who lives out in the countryside and is not like other people. They didn’t exactly call her a witch, but she knew an awful lot about animals and plants and supported herself. Granny McPherson is one of my favorite characters, and she again is showing someone who is basically an outcast of a community, but still a part of the community. At times, they would rally around her and sometimes they would not. All of my books are based on real things that happened in the past. The only difference between them and my adult books, really, is that the major characters are younger. But in the 19th century, and most of those books are set in the 19th century, young people who were even 12, 13, 14 years old and certainly 15 were making major decisions about their lives, what they were going to do, who they were going to live with, where they were going to live and so forth. And it’s a way to escape into that period and share it with people. A lot of my readers, actually, of my books “for children” are actually adults. A lot of adults read my books. LB: Well, back to the children just for a second. I’m sure they ask much better questions than I ever think of, so I want to steal one. What’s the best question you’ve ever been asked at a school visit? LW: Oh, other than how much money I make and how old I am? Which I get asked quite regularly, I might add. I think one of the questions that a lot of kids ask is, what is your favorite book that you’ve written? And of course I always tell them that I don’t have a favorite book, that’s like asking their parents who their favorite child is. So I go through my books and I say, I like this one because I wrote it in honor of my African-American grandchildren and I wanted to show them that even during slavery there were some choices. 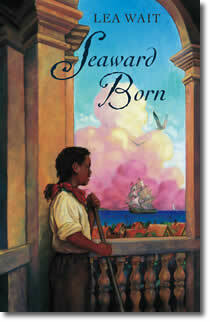 That book is Seaward Born. Wintering Well I wrote Will and Cassie because my children, who were adopted, had very close friends who were adopted from India and who had polio there. They grew up extended family with us and I kept thinking, okay, what would people have thought of them and how with they have dealt with a disability in the 19th century? And we go through that. For all of my books, especially the children’s books, there is a theme that says that whatever happens to these young people could happen today. But how community deals with them and they deal with the situation is very different now than it was in the 19th century. A lot of teachers like to talk about that theme, too, because it really pulls people back in the past much more so than just reading about a battle during the Revolution or a famous person who was able to overcome all obstacles. Well, but what were really the obstacles? What did people think in that period of time? LW: My website is www.LeaWait.com and I have information there about all of my books, links to prequels of a lot of the more recent books, questions for book groups or for school groups, depending on which books. There’s a lot of information on that. So that’s really the best place to find me. I’m also on Facebook and Goodreads and so forth. I must admit, I don’t tweet. I have failed in that part of my life. LB: No, no. I feel that is a perfectly fine thing to ignore. Lea, thank you so much for joining me today. LW: Thank you for having me. I’ve loved talking with you.